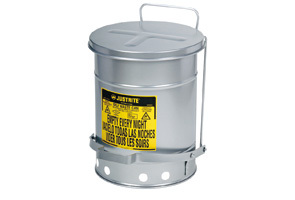 Unlike solid base units, these Oily Waste Cans are built with a unique, raised flow through base that circulates air around the can, dissipating heat for added safety. They won't melt like plastic pails. The new SoundGard™ lid incorporates a specially designed, sound muffling pad to significantly reduce lid closure noise while maintaining its FM approved function. SoundGard™ is ideal in settings where it's desirable to lessen disruptive noise such as laboratories or small process areas with complex workbench operations.